In Forms In Space Roy Lichtenstein integrates the readymade quality of screen prints and a painterly gesture with the use of thick lines, flat surface planes, and obscured perspective. The horizontal orientation of the flag depicts Lichtenstein’s signature dots. A tension between the painter’s hand and mechanical reproduction is exhibited in this print. Roy Lichtenstein takes a modernist perspective of the picture plane by utilizing a method of commercial design through comic strips and advertisement. Lichtenstein integrates the ready-made quality of screen prints and integrates a painterly gesture with the use of thick lines, flat surface planes, and obscured perspective. This three panel piece reproduces Lichtenstein’s 1974 painting “Cow Triptych – the artist’s homage to Picasso’s 1945 “Bull Series” where Picasso over a sequence of bull images, eventually renders the bull as an line drawing. 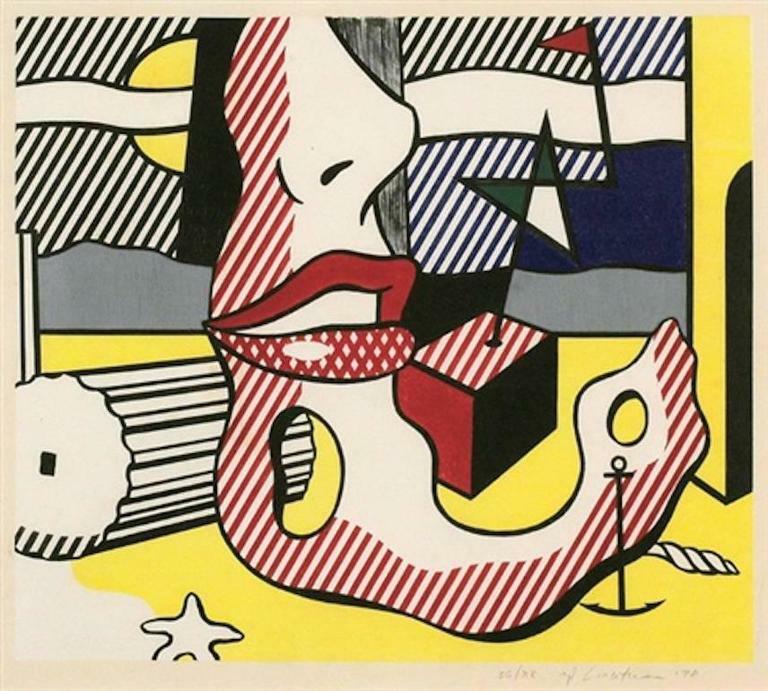 Lichtenstein also starts with a figurative image of a bull, but goes one step further, transforming his bull into his signature geometric planes and stripes. It is important to note that in 1974, when Lichtenstein created the painting, Minimalism was beginning to take hold, and Lichtenstein cleverly combines his Pop vocabulary with a Minimalist accent. A powerful work, beautifully framed.